"I never thought the rumors would spread so rapidly," Goho said. "I am truly sorry for any and all damage that I may have caused Jon and his family. Furthermore, I can only hope that he continues to bring prosperity to the Philadelphia region and surrounding areas." “I’m in a band as well, and I was going into the recording studio, and we had talked about how the music industry just started taking a turn into crazy new worlds that no one, really, can assess,” said Goho, 30, in a telephone interview Monday. “Long story short, I was talking to my band members on their down time, and we got so worked up in the conversation, I just kind of took the liberty and started (the rumor), because I was so irritated. APPENDIX #1: Hopefully this is the last bit of attention we give Goho on this blog, but Minutia has recorded a song/whiny rant in response to this saga called No Regrets. You can listen to it here. Conversely, Bon Jovi's No Regrets (the Bounce outtake) can be heard here. APPENDIX #2: Bon Jovi tour photographer David Bergman, who also took the photo proving Jon was still alive, wrote a blog about the whole death hoax incident... check it out at this link. Let's celebrate Christmas Eve with some videos of Jon Bon Jovi & Friends at Hope Concert V, which took place on December 19. Earlier that day, Jon had been the victim of an internet death hoax which he joked about throughout the night. We've been teased about this solo album for a decade or so, but is this the first time we've had a timeframe for release (albeit a very tentative one)? Either way, I'm keen to hear the results so fingers crossed! The Bamboozle Festival,North Beach Asbury Park. New Jersey Fire Department-First Aid Captain Douglas Gray told The Times that paramedics responded to a 911 call from the home. When they arrived, Bon Jovi was not breathing. The paramedics performed CPR and took Bon Jovi to Jersey Shore Medical Center, Ruda said. Hundreds of reporters gathered at the hospital awaiting word on his condition. The sources, who spoke on the condition of anonymity, said Bon Jovi team rushed to Bon Jovi’s bedside, where he suffered Cardiac arrest. The detectives plan to interview relatives, friends and Bon Jovis’s doctors to try to figure out what happened. The N.J. County coroner’s office will determine a cause of death. A New Jersey Fire Department source told The Times that Bon Jovi was in full cardiac arrest when rescue units arrived. And before long, news of Jon's "death" was trending on Twitter. 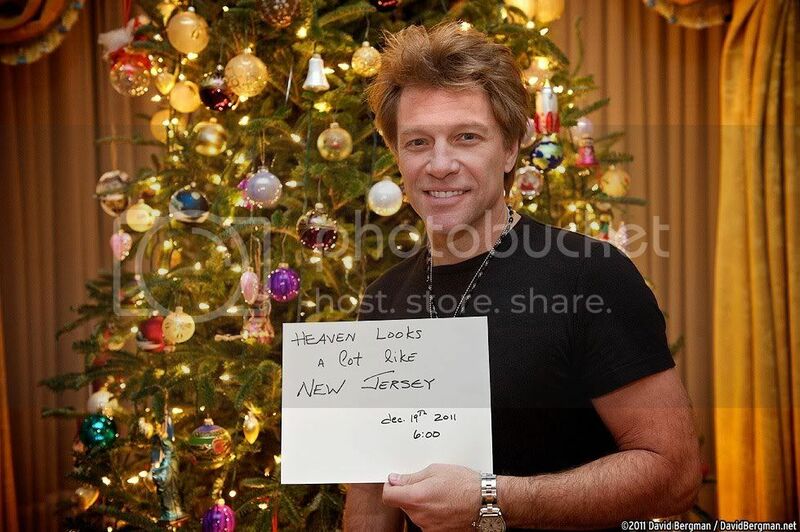 Confirming it was all a hoax, this photo was posted on Bon Jovi's Facebook and Twitter pages, as well as tour photographer David Bergman's Twitter. Here's Jon joking about his demise at the Hope Concert, where he performed that very night. I'll put more Hope Concert videos up soon but in the meantime you can check out this review from the Star-Ledger. Bon Jovi's Christmas song "I Wish Everyday Could Be Like Christmas" is being re-released in the US iTunes Store and Amazon MP3 Store with proceeds going to benefit the Special Olympics. I believe this was originally recorded in 1992 and released as a B-side to the "Keep the Faith" single in the US, but also replaced Back Door Santa on later pressings of A Very Special Christmas (which had originally been released in 1987). Can someone confirm or deny this? ASBURY PARK — The Bamboozle Festival, which has grown into a music institution since its inception in 2003, will return to its birth city here in May with rocker Jon Bon Jovi headlining the three-day event. John D’Esposito, Live Nation talent buyer and founder of the Bamboozle Festival, said Monday that it was time to return here, and the City Council last Friday agreed to sign an agreement for the 10th annual festival to be held on the city’s waterfront May 18, 19 and 20. The event began in Asbury Park, but by 2006 moved to the Meadowlands Sports Complex in East Rutherford. So far, Bon Jovi, one of the top-touring acts in the music business, and the festival’s other headliners, California pop-punkers Blink-182 and the Foo Fighters, a top-selling rock band formed in 1994 by former Nirvana drummer Dave Grohl, have been announced as performing. Read the full Asbury Park Press article here. Pre-sale tickets also go on sale today, check out BonJovi.com for details. FYI the rumours about Bon Jovi playing a show in Russia next year are NOT true. There have been scammers about trying to sell tickets to this non-existent show so be very wary.